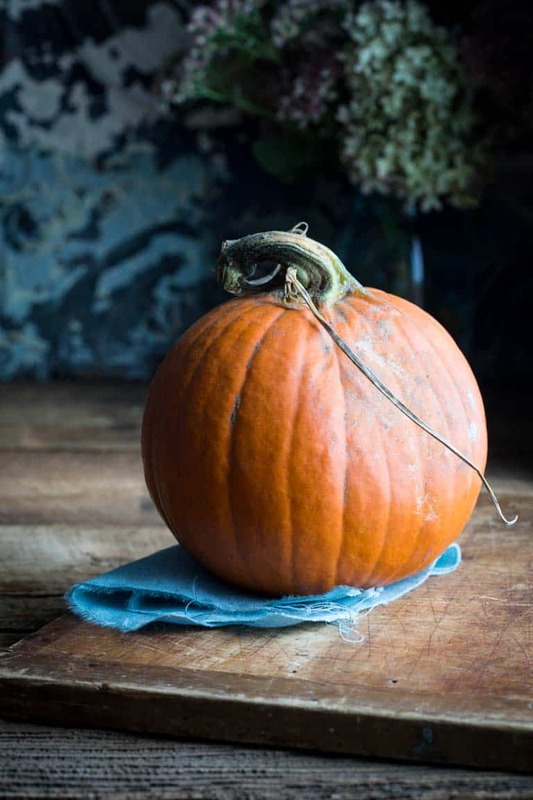 If you happen to buy a fresh pie pumpkin for cooking and you aren’t quite sure what to do with it, here is my easy step-by-step guide with photographs of how to peel, seed and cut a fresh pumpkin. Also, if you have yet to check my tips on how to make home-made pumpkin puree, you should do that too. 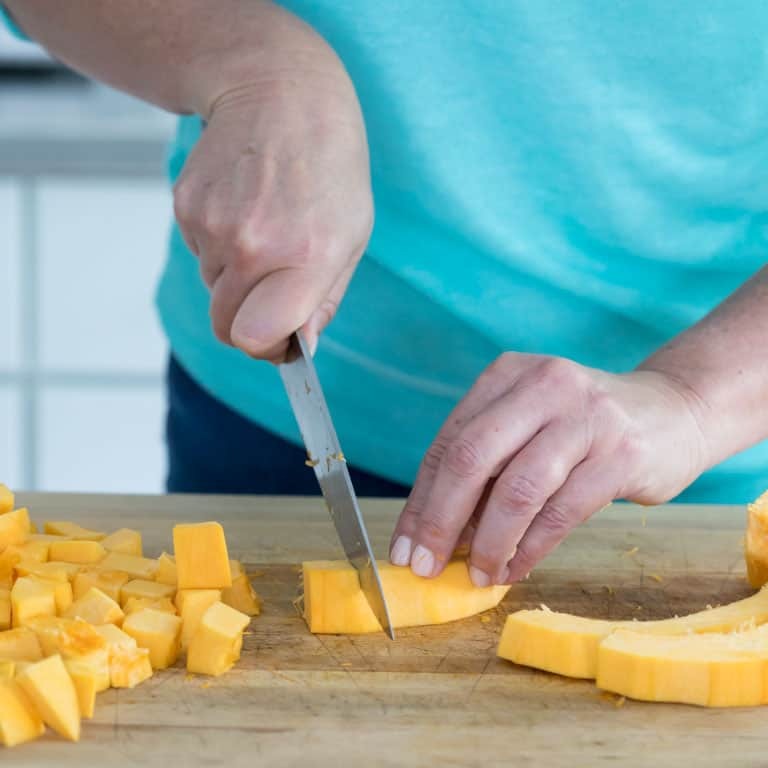 This technique is how you would prepare pumpkin for making cubes or dices for roasting, steaming or sautéing. First, and foremost, start with a cooking pumpkin! What is a Cooking Pumpkin? A cooking pumpkin, or pie pumpkin is a smaller pumpkin than a jack–o-lantern with smoother less-stringy flesh. Cooking pumpkins have thinner skin and smaller seeds. Cooking pumpkins are often not as groved as decorative pumpkins so they are easier to peel. Cooking Pumpkins are also often very round, which makes them easier to dice safely once the tops and bottoms are sliced off to make a flat surface. 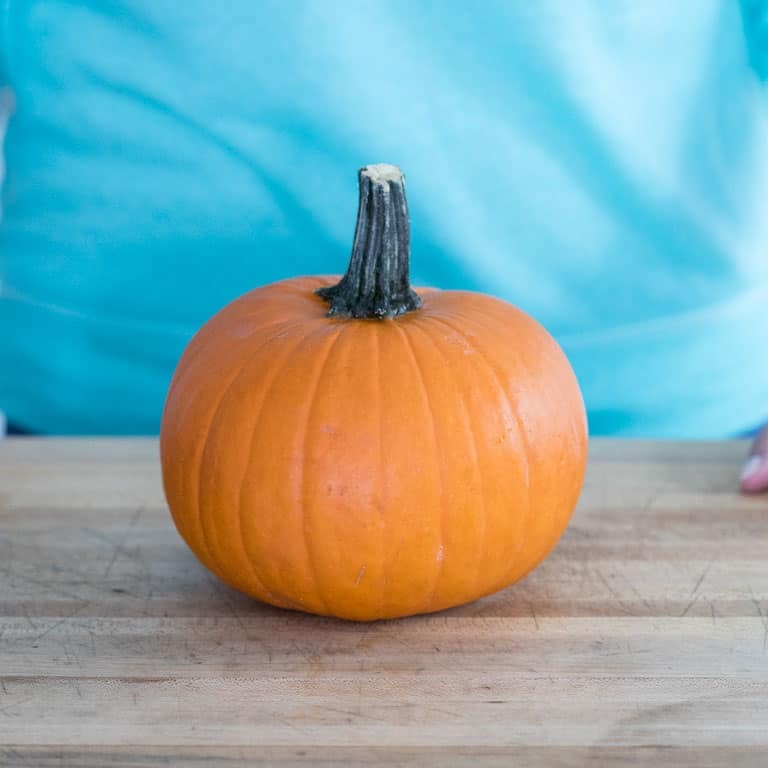 Pumpkin is grown on a vine in a field on the ground in the dirt, and therefore may have dirt on it when you bring it home from the farm or market. Wash it as soon as you get it home so that there is no dirt on the skin anymore. If you don’t, the dirt (which has spores in it) will cause the pumpkin to rot. First, make sure your cutting board won’t slip by placing a sticky mat or wet paper towel under it. 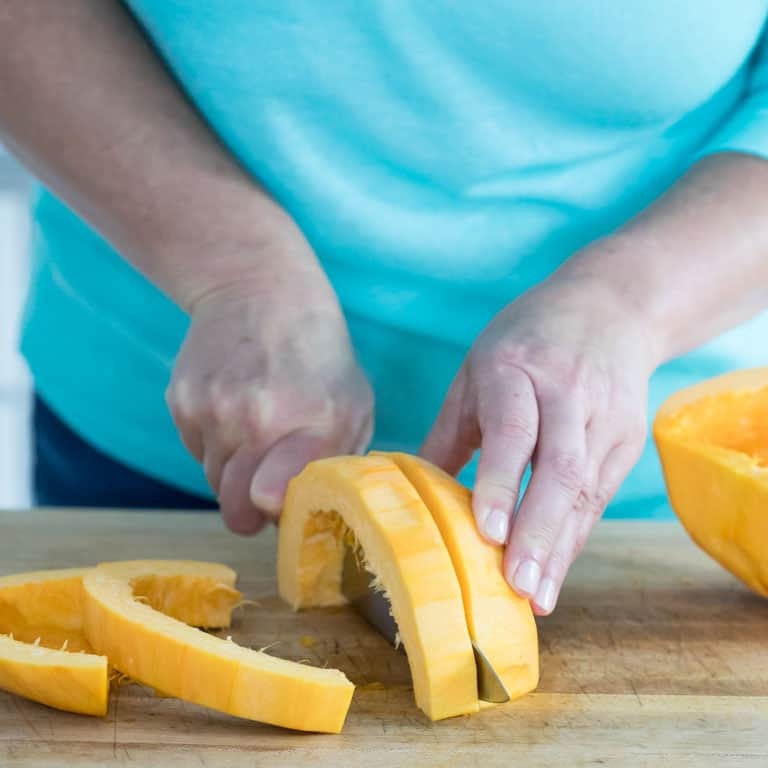 Use your sharpest chef’s knife to cut the fresh pumpkin. 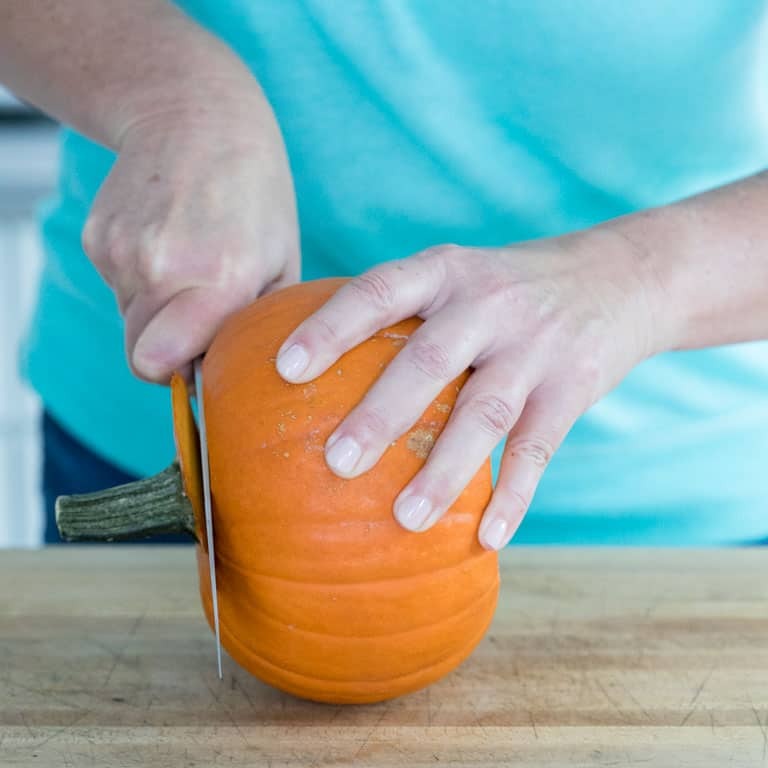 Cut the top and bottom off the pumpkin to make flat and stable cutting surfaces. 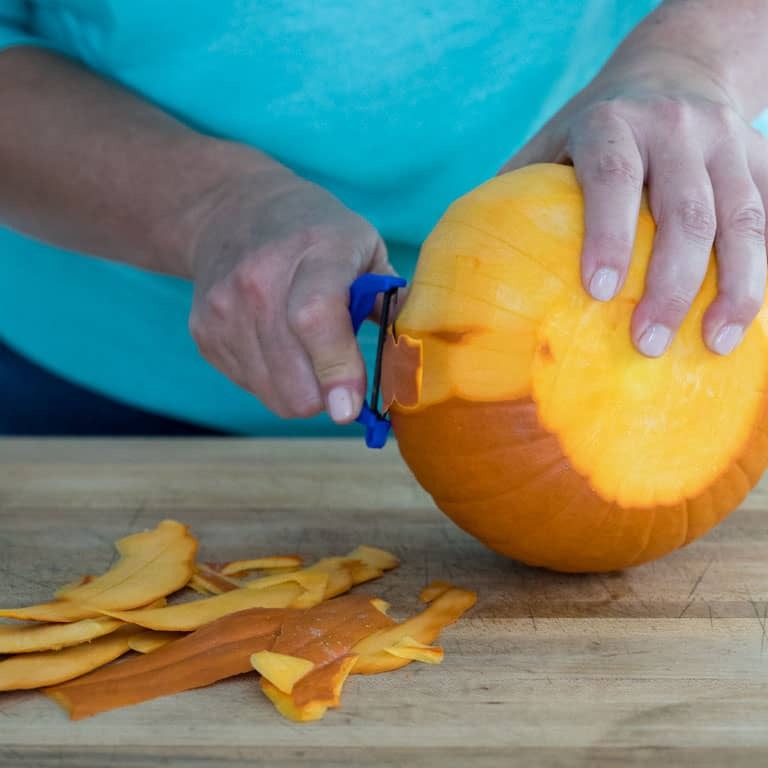 It may be hard to cut off the area around the divet on the bottom of the pumpkin (like a punt in the bottom of a wine bottle) but you can easily cut that off in a later step, so just ignore it for now. 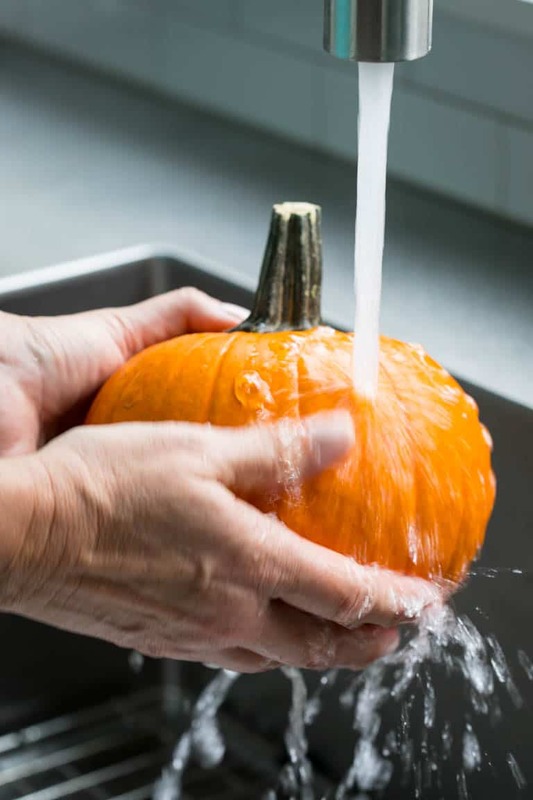 Use a very sharp vegetable peeler to remove the skin of the pie pumpkin working from flat cut end to flat cut end end in long inch-thick strips. If you do not have a very sharp vegetable peeler, you may prefer to use a sharp pairing knife instead. 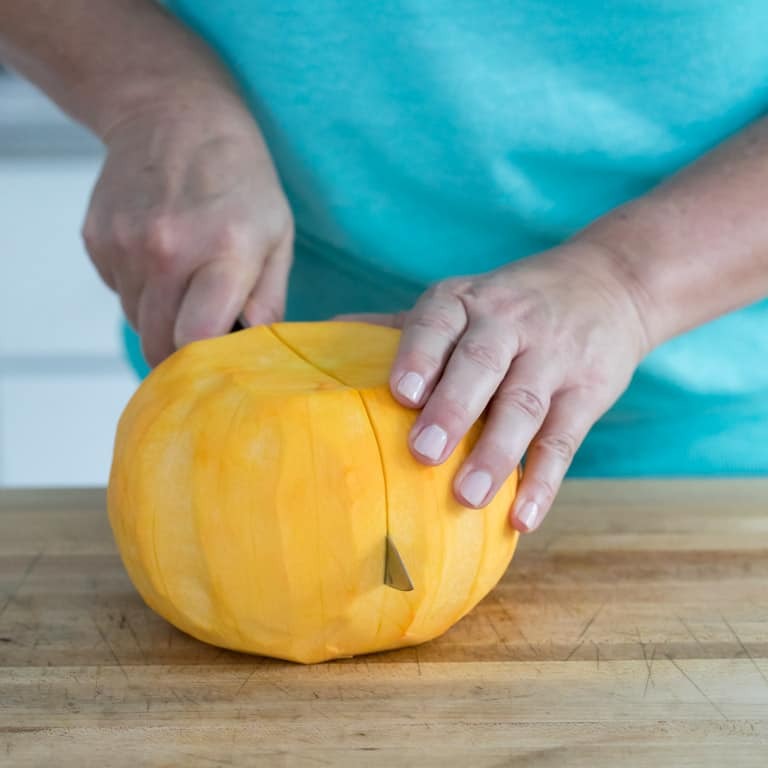 If so, stand the pumpkin on end (flat-side down) and remove strips with the knife blade facing down toward the cutting board. Stand the pumpkin on the cutting board on one of the flat sides. Cut the Pie pumpkin with your sharp Chef’s knife right through the center. Be careful not to press on the tip end of the knife without using a kitchen towel to protect your palm. To remove the pumpkin seeds, hold a spoon in your hand, with the bowl of the spoon facing down or away from you. 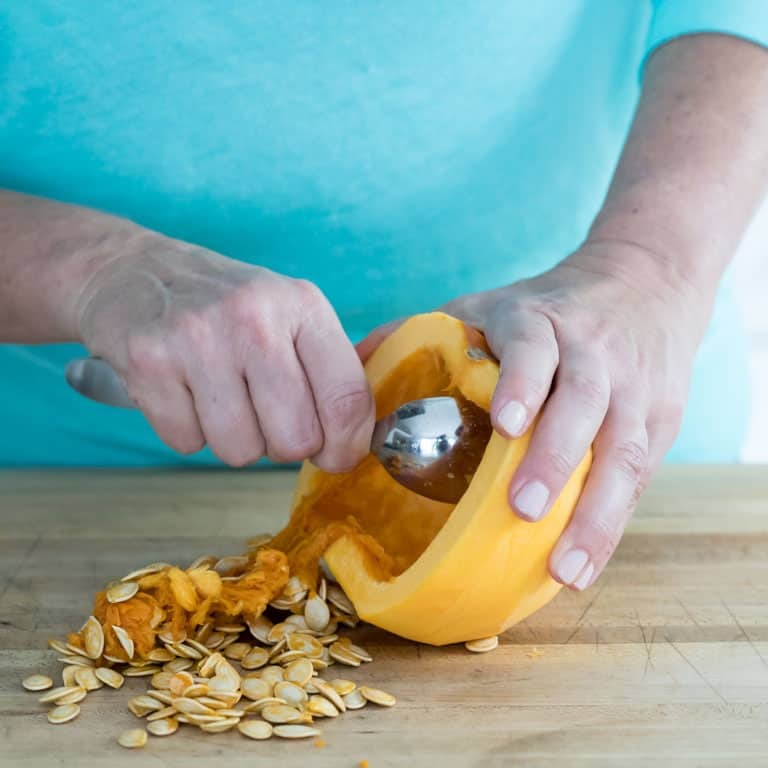 Hold the cut pumpkin half firmly against the cutting board and scrape the pumpkin guts (also known as seeds) out with a spoon. You can wash them off and roast them with oil, salt and pepper for a healthy snack. For a sweet and savory treat you can make these Cinnamon Sugar Pumpkin Seeds. Stand your pumpkin hollowed-out side down on the cutting board. Cut the pumpkin into strips as wide as your recipe calls for (if it calls for a 1-inch dice cut it into 1 inch strips.) If your recipe doesn’t specify a measurement, I recommend cutting the fresh pumpkin into strips as wide as the flesh is thick. That way it will cook evenly. One strip at a time, cut the pumpkin half moons into cubes. Work left to right and keep the cutting area clear. Keep your finger tips down under your knuckles and knife tip close to the board. 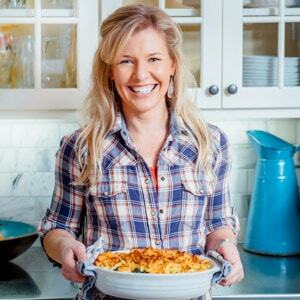 From there, you can cook it just like you would cook cubed butternut squash as in this roasted butternut squash recipe or stove top recipe. Thanks so much for reading! Please leave me a comment below and let me know if this helped or if your tried cutting your pumpkin with these tips. Also make sure you sign up for my email newsletter. These steps are so great! Fresh pumpkin is so much better than canned! 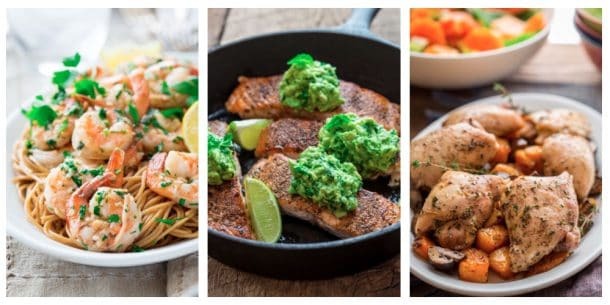 Love the step-by-step tutorial and photos. I’m guilty of using most pumpkins for show rather than cooking, so loved learning hot to properly cut it up! That reminds me, I wanted to buy some decorative pumpkins! Glad the photos help. What a great step by step guide, so useful to have. Great photos too. Thanks so much Michelle! I am so glad you think so. Enjoy your week. That’s awesome Maria. I am so glad I decided to share it then. That’s music to my ears. What a handy resource! I am sure it’s going to help lots of people this pumpkin season. Superb & fantastic article. Just phenomenal. Thanks a lot. Keep up the great job.